O.K,.MAJOR disclaimer. 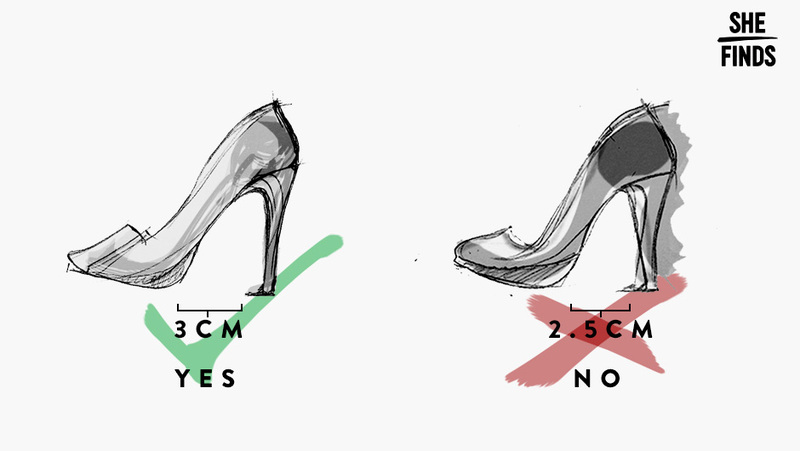 I can’t take one ounce of credit for the following information but when I came across this article that touts determining heel height and COMFORT, I have to share it with you my wonderful readers ASAP. Bearing in mind that all things concerning fashion and style are of utmost importance, what could be more life changing than being able to determine if your high heel purchases are going to be comfortable prior to purchase! Thanks to the peeps at She Finds.com I share their 2 second trick to determine if your heels are going to be comfortable . I mean seriously….2 seconds. I’m in and so will you be after reading this: Enjoy! Buying new heels is always dicey. Especially if you buy them online or can’t try them on in the store–you have no idea of knowing whether they’ll be the most comfortable shoes in the world or if they’ll be horribly painful and wreak havoc on your feet. Some shoes that you assume would be comfortable, like low heels or wedges, can turn out to be the worst culprits. You just never know! Or–that is, until right now when I’m going to drop the most amazing truth bomb on you: there is a way to tell if heels are uncomfortable just by looking at them. This 2-second trick is a game changer and every shoe lover should know it.